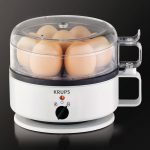 Krups Egg Cooker Review: The KRUPS F2307051 comes from the well established KRUPS brand. Over the years KRUPS have produced some top rated kitchen appliances from coffee machines to egg cookers. 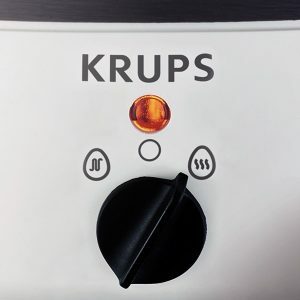 The KRUPS F23070 itself is capable of preparing up to seven boiled eggs at a time to the exact doneness you want. And if you get fed up with having boiled eggs the F23070 also allows you to cook poached eggs using the supplied poaching trays. 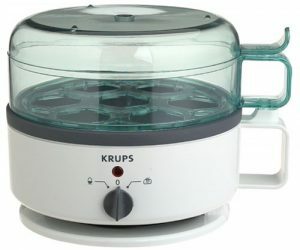 The Krups is available in a single color and when writing this review it was available for $35.00 – $40.00. The price may have changed since we reviewed this unit. 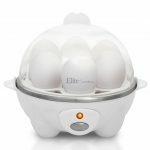 Boils up to seven eggs – The reasonable capacity of this cooker means you can easily prepare eggs for a small family breakfast. Two poaching trays – The plastic inserts for poaching eggs work great and eggs come out easily once cooked. Water level indicator – Easily use the correct amount of water needed to get the consistency you enjoy by using the convenient water level indicator. Dual switch – Use the dual switch to keep eggs warm once they are cooked so they are still warm when your serving them to eat. Timer – You no longer have to continuously watch a pan of boiling water so you can get on with other work, you just have to wait for the timer to alert to the end of the cooking cycle. Egg Piercer – Easily pierce the eggs using the supplied piercer instead of trying to use a knife. KRUPS appliances are always pleasing to the eye and the F23070 cooker is no different. The modern, stylish appearance and compact design could make the F23070 a permanent fixture on your worktop. The KRUPS F23070 is a small appliance, measuring in at just 6.4 x 7.7 x 5.5 inches, which makes it ideal for placing on even the smallest kitchen counter-top. The main body of the unit is split into 3 different pieces. The heating element is found in the base that is a white color. You then get the transparent egg holder in the middle that holds up the eggs over the heating element. And then there is the transparent lid. A great design feature is the handle on the side of the appliance. When the buzzer sounds, you will easily be able to pick up the cooker using the handle and move the hot eggs to the faucet and cool them by running them under cold water, so you do not risk burning your hands. When you un-box the unit you will also find a measuring cup and egg piercer. The egg piercer is used to pierce the egg to prevent the eggs from cracking. The measuring cup comes with the measurements appearing as raised marks on the side of the cup. You can then pick the level of doneness you want: soft, medium or hard by filling the measuring cup with water to the relevant. KRUPS F23070 – What is it like to Use? The Krups F2307051 Egg Cooker has a calibrated water-level indicator that allows you to pour the exact amount of water needed. A Signal indicates end of cooking cycle so eggs are not overcooked. Cleaning the appliance could not be easier as both the Lid and egg holder are dishwasher safe for quick clean up. The F2307051 has a Dual switch to easily alternate between boiling and the keep warm setting. As you can seen in the below image it is easily to switch between these settings using the large switch. 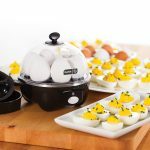 To cool eggs quickly before serving the unit comes with a removable egg holder. It is great at cooking perfect eggs; either hard boiled or poached. Built to be compact the cooker does not take up much counter top space and has a modern design. If your not a fan of boiled eggs then those of you who prefer poached eggs will be glad that you have the option to poach up to 2 eggs at a time using the supplied tray. “I bought this egg cooker so my husband could have his favorite breakfast for his first fathers day, eggs Benedict. He was so excited. They turned out great! He now uses the cooker in the morning to poach eggs. I like it for hard-boiled eggs. They turn out perfect, no green yolks! “I figured I was being pretty frivolous, getting an egg cooker, of all things. However, this is a WONDERFUL gadget! It cooks the eggs perfectly, however you like them. I always had trouble getting them just right in a pan. The overall impression you get from user reviews is that the Krups Egg cooker is easy to use and cooks eggs consistently good every time. The KRUPS Egg Boiler F2307051 has been reviewed by over 2000 customers on Amazon and has been given a rating of 4.4 stars out of 5.0. See the latest user rating at Amazon. Answer: It should take approximately 12-15 minutes to cook hard boiled eggs. Do you need to pierce the eggs before cooking? Answer: Yes. You are supplied with a measuring cup that also has sharp point on then end that you use to pierce the egg. Answer: You are supplied with 2 poaching cups, so you can poach two eggs at the same time. Answer: The reservoir that holds the water during the cooking cycle has a non-stick coating, which makes it really easy to clean, even if you live in a hard water area. Does the cooker Boil the eggs? Answer: The cooker uses steam to cook the eggs so you get consistent results every time. If you and your family enjoy eating eggs then the speed and convenience of using the KRUPS F23070 cooker makes it a contender for your kitchen. And to mention the almost zero clean-up involved will make this unit a much better alternative than pot-boiling. We were pleasantly surprised by the Krups F23070. 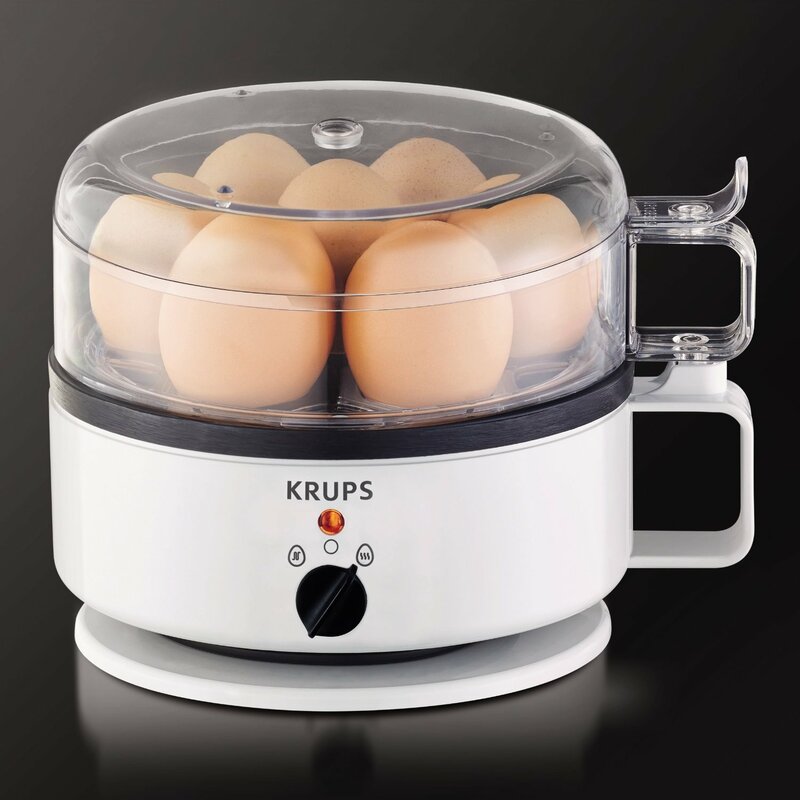 With its large capacity and sleek design the KRUPS F23070 Egg cooker will suit almost anyone and its capacity should allow it to easily cater for a large family. This unit comes with easy to follow instructions and simple controls making it easy to cook boiled eggs when you want them especially if your like me and don’t have the patience to boil water in a pan, and wait for the eggs to be done. When we looked at user reviews and opinions it has been clear that the F23070 consistently scores highly. At the time of writing this review the KRUPS F23070 has clocked up over 2000 user ratings on Amazon with an average rating of 4.4 out of 5 stars. 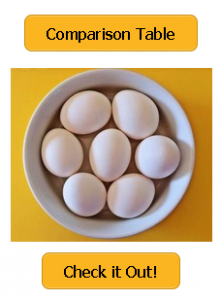 If you found this review useful and your interested in getting a unit capable of cookong upto 7 eggs then you might be interested in the Egg Genie. 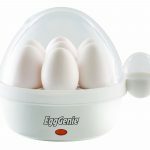 Find out more about the Egg Genie by reading our updated Egg Genie Electric Egg Cooker review. Before you start cooking, ensure you have everything you need. In the box you should have the egg cooker, 2 poaching trays, egg tray and measuring cylinder. Plug the power cord into the power socket. Removed the lid and egg cooking tray. 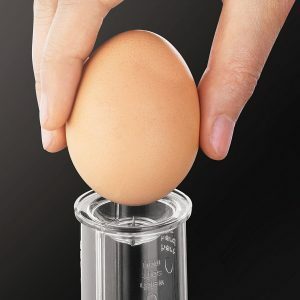 Using the supplied measuring cylinder, measure the amount of water you want base on whether your cooking soft, medium or hard boiled eggs. Pour the measured water into the base. When placing the tray onto the base ensure the handle on the tray aligns with the handle on the base. They should fit snugly together. Before you place the eggs into the tray you will need to pierce the narrow side of each egg. You can use the piercing tip on the base of the measuring cylinder to do this. Ensure you place the pierced side of the egg towards the lid of the cooker. Use the dial on the front of the unit to switch it on. A buzzer will sound when the eggs are cooked. Before removing the eggs ensure the cooker is turned off. For extra safety the power cord wraps around the base so ensure you do this when you are finished cooking. If you want to find out more about the using the F2307 such as how much water to use you can find the information in the KRUPS egg cooker manual. 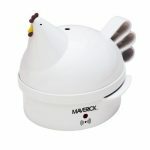 For more information about the manual and replacement parts visit the manufacturers website www.krupsusa.com/f230-egg-cooker .